Startukulele is a website for all new & beginning ukulele players. The objective of this site is to help everyone who wants to learn to play this wonderful instrument succeed in their goal. The menu above will take you to pages dedicated to learn to play the ukulele, from the bare basics to how to play ukulele chords, the best how to play ukulele books and easy songs to play on ukulele. So browse around, pick up the basics, learn how to play the chords, learn to play some songs and have fun with it! You will see that the ukulele is a wonderful instrument to play, and the best part is that it’s relatively easy to learn. 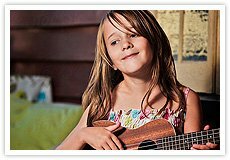 For those really dedicated there is the Learn Ukulele in 30 Days lessons which provides a step-by-step guide of ukulele lessons for beginners.